Ridgeline Aviation is a helicopter and airplane charter company based out of Cordova, Alaska. We offer charter services and air tours for all your needs. All employees of Ridgeline Aviation undergo yearly recurrent training, are required to participate in a DOT supervised drug program, and put safety at the front of every flight. We are an FAA Certified Part 135/133 Air Carrier with Hazardous Materials Authorization. Steve Richards is the owner and operator of Ridgeline Aviation. He started flying airplanes in the early nineties and helicopters a few years later, with a combined flight time of over 13,000 hours. He started flying in Alaska in 1995 and has 25 years of flight experience. A pilot and mechanic, his background is diverse; flying for charter companies, corporate clients, NGO’s and the US government in various aircraft around the world. 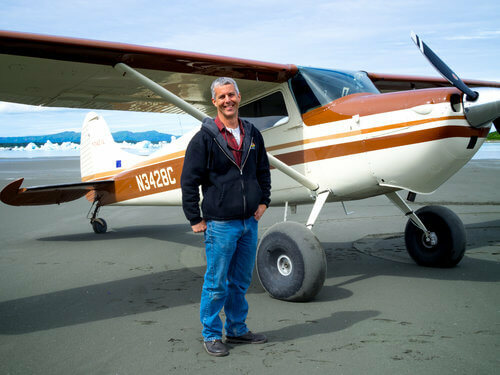 He founded Ridgeline Aviation in 2006 and is now based out of Cordova, Alaska. The R44 is known for reliability, efficiency, and comfort. It has passenger seating for three, an unbelievable view, as well as a cargo hook, and external load racks. The R44 is an ideal helicopter for transport, sightseeing, photography and aerial survey due to its large bubble windows, excellent performance, speed and low cost of operation. The R44 has been Alaska proven for decades, and is the standard for reliable and economical helicopter support. Our Cessna 170B is a single engine, fixed wing airplane. It has been completely rebuilt with heavy duty gear, big tires, and a fuel injected 180 horsepower motor. It is equipped for improved and unimproved landing areas. The Cessna accommodates up to three passengers, depending on cargo and distance traveling. It is great for taking two people with outdoor gear into unimproved landing strips. If you ask locals about Cordova they will tell you that it is “Alaska’s best-kept secret.” Cordova is located between the Copper River Delta and the southeastern end of Prince William Sound. Although fishing is the backbone of the community, there are recreational opportunities for everyone, and a town that is welcoming, diverse, and friendly. Come visit!